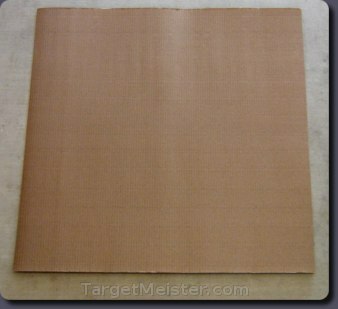 30" x 30" single-sided cardboard target backing. Sold individually. Although the backing is flexible and roll-able for your convenience, it becomes a very rigid target backing when firmly mounted to the wooden target support strips using adhesive, staples, clamps, etc. For maximum rigidity, mount the backing with the pleats perpendicular to the mounting strips. Most of our target stands can be used without a target backing; however, the slightest wind can easily rip through your target. It is best to just use this reusable, long-lasting target backing. The backing's roll-able nature allows it to conveniently fit into your target system bag. You'll get peace of mind knowing you always have a cardboard backing, or two, stored with your target stand. No more digging through the garage or the garbage for a cardboard backing or realizing you forgot it once you are already at the range.